There are 6 motel rooms each equipped with a small refrigerator and microwave oven. The rooms have a combination of 2 beds in either a queen, double or single size. Our rooms have heat, air conditioning, cable TV and WiFi internet service. 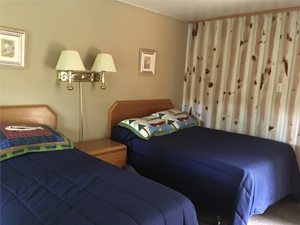 Some of our motel rooms can be combined to create a suite to accommodate larger groups. No dogs are allowed in any of the motel rooms. Our cottages are rustic in character which gives them a true Adirondack feel. Each of the 5 housekeeping cottages are fully appointed with the same amenities as our motel rooms, but include fully equipped kitchens or kitchenettes. The cottages are housekeeping cottages and you are the housekeeper!! Cleaning supplies, vacuum cleaners, ect. are provided for you. Of course, if you need additional linens or towels you just need to ask. We do allow a maximum of two dogs in our cottages so please ask about the details of our pet policy when you call.